We are proud to announce that we will soon release a splendid smartphone-music version of the Christmas song “Silent Night.” The whole video will be released on Saint Nicholas Day, 6th Dec 2012. We have been preparing this special project since summer. Marc is giving you an insight into his perspective, explaining the special case of realizing “Silent Night” with the DigiEnsemble Berlin. It is summer. People are walking around in summer clothes. 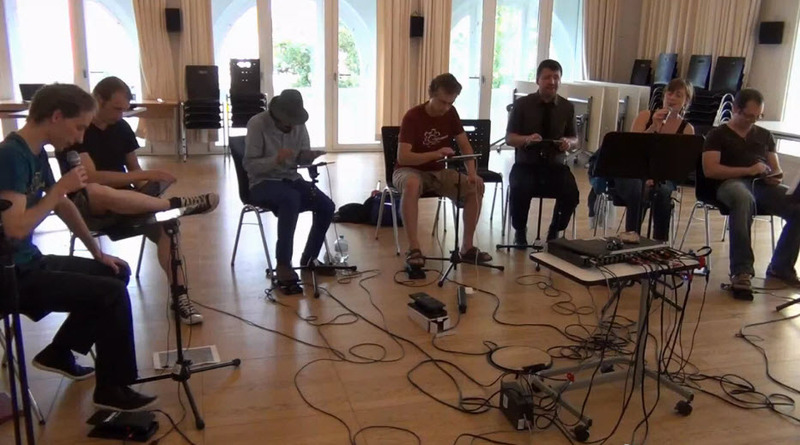 And so does the DigiEnsemble Berlin. With one slight distinction: we are rehearsing a Christmas song. When I was asked to arrange “Silent Night” for Smartphones etc., I was yet again confronted with a conflict. On the one hand, I really enjoy making music on my iPad, but on the other hand, I do not think enough inside the instrument as I do with other conventional instruments that I already utilized for writing music. I am convinced that those who also seriously engage with this new way of making music will agree that thinking away from the accustomed instrument is rather difficult. Quite often, you simply tend to imitate a conventional tone that would sound better and more natural with a real piano. This conflict occupied my mind for a long time and affected my work. When the idea of the pop song emerged, I started creating a lot of ideas, while quickly discarding many of them a moment later. My thoughts were repeatedly torn between spaceship music and classical Swing. When the six of us met for the first rehearsal, I was still dissatisfied with my product. I prepared two proposals for that rehearsal: a swing version and a rather open draft, which could retrospectively be called “Captain Kirk’s Lullaby.” In our initial debates about how to approach the piece, it quickly became clear to all of us that we had to run another path: To find out what original iPad music is, it must evolve from itself – from making music with iPads. Consequently, we started experimenting with ideas. We checked out sounds, discussed rhythms and tried many different things. This way of working was very pleasant since the piece “Silent Night” was in a sense the rough diamond that we were now cutting. Hereby, the abolished parts were the knocked off splinters leading to a Gesamtkunstwerk which could not have been imagined before. Most of the time, we worked as a team, which was especially comforting the pop song, since the group improved and perfected the piece to its final state. Thereby, everybody was responsible for his or her own part. Interestingly, the overall playing structure developed rather late, since we spend a lot of rehearsals on testing different ideas rather than finding a fixed form. But not everybody was pleased with this way of working. With hindsight, I realized that especially the recording session finalized the piece while it once and for all proved to the group that it was not one of those pieces that you could easily anticipate beforehand. I believe that we, to some extent, sensed the meaning of think inside the App instrument – or whatever you want to call it.